Fringe is huge right now and I'm trying to incorporate it into so many of my looks. There's something totally carefree about a fringe skirt- it's a little edgy because of the faux leather, but the fringe gives some fun movement to break it up. I'm drawn to statement pieces for outfits; they can be worn with simple pieces for an everyday look or paired with other statement pieces for a striking outfit. I initially worn an embroidered blouse, but they went back to my favorite printed denim shirt from Marshalls. Ladies, when in doubt...pair it with a chambray. You can't go wrong! I get all my denim tops from Marshalls because they have so many prints and carry my favorite label: Cloth + Stone (carried at Anthropologie) and sold for a fraction of the price. And I couldn't resist the little animation. 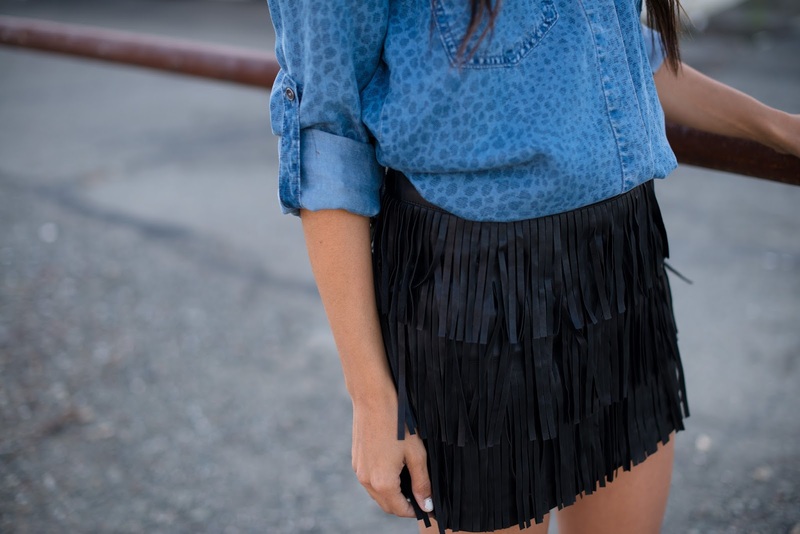 It's the only way to show how fun wearing a fringe skirt it. Since it's such a trendy piece, I got it at Forever 21 since it wasn't too much of an investment. LOVE the animation. Great outfit. totally loving the skirt and the shoes! pretty look!